Showing results for tags 'Tube Amplifier'. 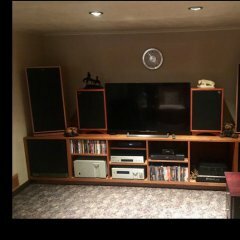 I bought this amplifier new from a friend 2 months ago, I broke the original box seal myself, and set it up with my Klipsch La Scalla II's II. I truly loved the sound, but I felt I would have to buy a matching tube pre amp for it, and do not want to spend the money. Decided to go with an Integrated PrimaLuna Dialogue HP (tubes) and Although the MC275 sounded better with the La Scalla's, the PL is a bit more functional for my situation I have less then 30 hours conservatively speaking of use on it. it works great. I have all original boxes and accessories, it works like a champ. Nothing has been changed on it, just plugged it and connected to my speakers. Hope someone will find a loving home for this beautiful baby. It is worth every penny you pay for it. Pm if interested. Pictures to follow soon.